I recently got paid and so I decided that the right thing to do was to walk into the Nu Metro Media Store at Ceddi Plaza, Central Area Abuja for book and window shopping (the place reeks of affluence; it made me want to grab a gun and shout “stick em up!”). I finally settled with Chimamanda Ngozi Adichie’s “Purple Hibiscus”, her other book “Half of a yellow Sun” and Sefi Atta’s “Everything Good Will Come”. The 3 books have been ringing in my ears for months now as I‘ve been seeing the buzz about them everywhere I go in the Naija blogosphere. I’ve just got through Purple Hibiscus and if you asked my opinion I’d say it’s a good book, but I’m somehow not so awed by it. You see to me a great work of art is art that knocks me off my feet that upon consumption I’m like “this is genius! How did the artist manage to do this?” But in the case of Purple Hibiscus I could relate with pretty much everything the author put into her book and I understand where she was coming from characterization wise, that in a good month with the right inspiration and guidance I could well have written the book myself. 1) Via many years of being a read and write freak online I understood the consciousness she put into the characters Obiora, Aunt Ifeoma and Amaka (Although she made Obiora wise above his age. I think it’s very much the exception for kids to be capable of that level of consciousness at that age. Being highly pro-Nigeria I could relate with Amaka’s alternative musical taste and philosophical stance). 2) Having frequently visited my village over the past few years I was happy with her apt depiction of village life in Igbo land and I was impressed by her great love for her Igbo roots. 3) Having had my university education in Nsukka between the year 2000 and 2006 I very much felt at home with the novel. 4) Having witnessed military rule in my awakening teenage years I could very much identify with the plot of the novel. 5) I went to a seminary secondary school but now considering myself a very liberal Catholic I could very much identify with her religious views as painted in the novel. 6) In life I’ve known what it means to be rich, middle income earning and poor, so I understood the extremes painted in the novel. I’m now off to read “Half of a yellow Sun” and “Everything Good Will Come”. I hope they’ll sooth away my annoyance with Chimamanda for allowing Kambili's mum poison her dad. but i enjoyed Sefi Attas alot! This looks to be more of a confessionary than a comment. I stumbled on your blog, through Nneoma's... I understand your feeling about Purple Hibiscus... close to mine actually. Half of a Yellow Sun will redeem her in your opinion, I believe. And don't expect to be wowed by Everything Good will Come.... reads like a collection of stories packed into one, a collection that would have worked better in volumes. ok ok ok i get it. I should finally get around to reading adichie's books. I think i may travel to my local bookstore and pick up at least one of them this weekend. any recommendations on which to read first (very limited budget). @nneoma: they're both good reads, but in the case of a limited budget i suggest you go for the superior: Half of a yellow Sun. still i think Purple Hibiscus is more of an "easy" read and i would buy/recommend it instead for younger people. @Tiona and Yosh: definitely, i understand, i feel you. i have to strongly disagree with u for rating Half of a Yellow Sun 'superior' to Purple Hibiscus. that's like saying kanye's Graduation album is better than The College Dropout! also, i thought it quite clear that the simplicity of language in Purple Hibiscus was/is a stylistic device to accentuate the fact that it was written from the perspective of a child. have u read Everthing Good Will Come yet? how did u find it? i thought it was rather forced... the Nigerianism came across as phony to me, and she's just not that good a writer. imo. or lets say instead that the novel did not do much to showcase her skill. I had to read "Purple Hibiscus" as one of the set texts for Commonwealth Literature (a course in my department) and I thought it was a good read. The one I fell in love with immediately was Helon Habila's "Waiting For An Angel". I still feel that novel is a resource for the kind of movies Nigeria and I should get into making. what are the similarities and differences in your novel purple hibiscus and atta's everything good will come. 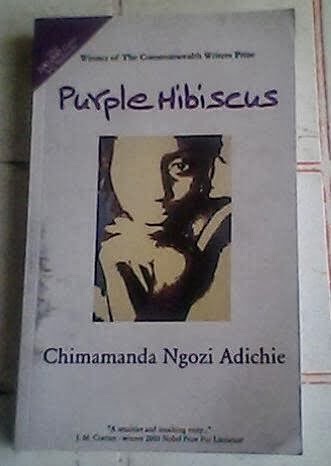 presently am asign 2 read purple hibiscus n am not regretin d fact 2 read such a text i must comfess Adichie's creative work was superb though got angre at her concluding styl.